How many times have you walked into a GP implementation done by a previous VAR and cannot establish what changes have been done on a report, if any? Or how many times have you come across forms and reports dictionaries with tons of objects and cannot tell by simply looking at these if they have been changed or not? Or have you made some changes to a report a few years aback and now cannot remember what these changes were? I get this question every once in a while and finally someone was keen enough to post it on the Dynamics GP public newsgroup. Let me start by saying that ALL modified forms and reports should ALWAYS be backed up in the form of package files, and that ALL these package files should be stored in a source code control repository -- for example, Visual Source Safe -- and versioned if all possible, with notes on all changes done from version to version. However, this is not always possible, especially if the company happens to be a small company with limited technical and software development resources -- unless of course, the business happens to do software development :-) ). 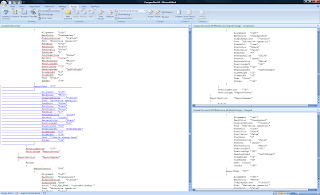 In order to establish what changes have been done to a form or a report, without having a source control repository, you can use old fashioned Microsoft Word... well, I will be using Microsoft Word 2007 for this example. 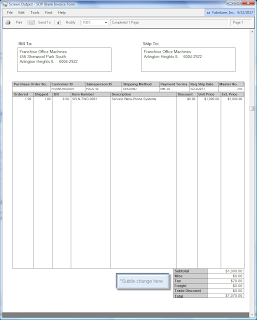 In addition, we will use a slightly modified version of the SOP Blank Invoice report. 2) From a workstation not pointing to the REPORTS.DIC dictionary file containing the modified report or from a standalone copy of GP, say for example the one you carry on your laptop, print the SOP Blank Invoice report to screen. Go to Transactions > Sales > Sales Transactions and choose an invoice. Print to screen. Click on Modify to open the report with Report Writer. 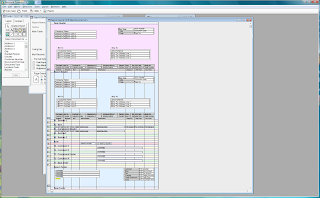 Once the report is shown in the Report Layout window, return to Dynamics GP. 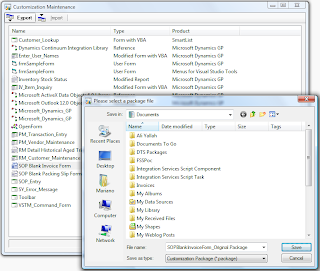 3) Repeat step 1 on your standalone environment, this time saving the file as SOPBlankInvoice_Original.package. Move the SOPBlankInvoice_Modified.package file to the same directory with the SOPBlankInvoice_Original.package file. This will both files easily accessible. 4) Open Microsoft Word 2007. Click on the Review menu item. Remember: it's not about the tools, it's about how you use these tools to meet your needs. I hope this article provides a mechanism to quickly and accurately identify changes between original reports and customized reports and help you get a headstart when working at customers and customizations you have not created -- or may have and don't recall :-) . Excellent tip! I didnt know Word 2007 had this feature ... I used to use Windiff for the comparisons. A reminder that if you start with an empty FORMS.DIC importing of the package(s) will not contain any changes or additions that had been made to formats or resource strings. These will need to be redone within Modifer and/or Report Writer. The classic here in Australia is removing the format string for phone numbers. Thanks for the insight! That's an excellent point. I am glad to see you posting comments to my articles :-) It's hard to predict how other countries use GP. Your experieces are valuable so I encourage you to comment on my articles. Great tip! I am attempting to organize and consolidate dozens of modified GP reports for a client and your tip on how to identify report modifications with Word will be very helpful. Also, this is the first I ever heard about backing up modified reports with package files. I was taught to just do nightly file system backups of the Reports.dic that is shared on the network. 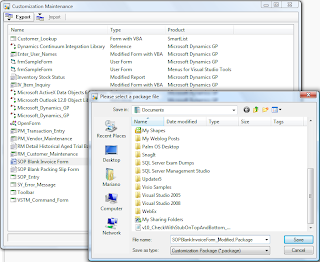 Backing up individual reports with package files seems to allow for a lot more control. Thanks for the post! Welcome Leslie Vail, MVP to the blogosphere! Microsoft SQL Server codename "Kilimanjaro"
Welcome Frank Hamelly, MVP to the blogosphere!